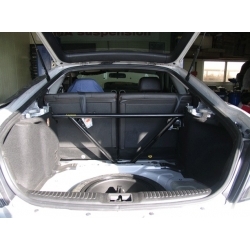 ARK Front Strut Bar in newly designed bar after old model was discontinued. It has fresh stylish looks available in red and blue. 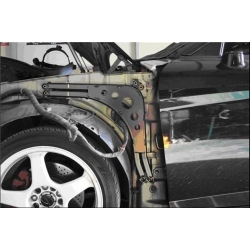 Luxon Front Frame Reinforcement GK eliminates front/back rolling during hard braking or takeoffs. 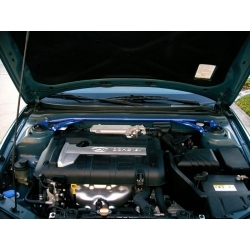 The MotorsLine Blue front strut bar is made of ultralight aluminum for maximum strength and minimum weight. 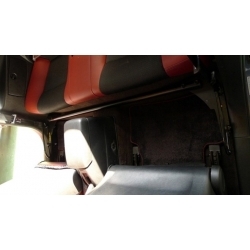 Motorsline Center Bar reinforces the lower mid section of the chassis along with front and rear strut bars. MotorsLine Front Strut bar is one of the best looking strut bars ever made for tiburon plus it also.